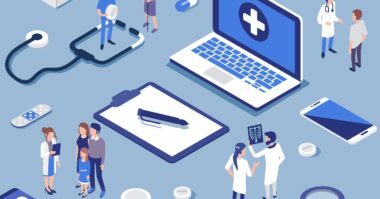 Most healthcare marketers have come to view content as a powerful engagement tactic, but many still struggle to measure effectiveness and to consistently create enough high-quality pieces with their current staff. 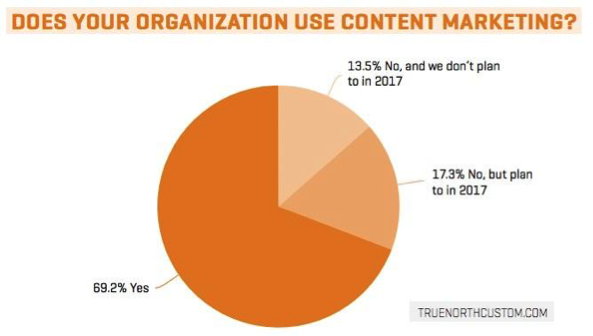 Those are a few of the key insights from two recently released research reports that examine how firms in the industry are tackling content: The 2017 State of Healthcare Content Marketing, a survey of mostly B2C healthcare firms from TrueNorth Custom, and Content Marketing and the Battle for Attention, a survey of mostly B2B healthcare firms from DamoDigital. Overall, the surveys found that content marketing has become mainstream for healthcare organizations. Some 69% of B2C healthcare firms polled say they already are engaging in content marketing and 17% plan to start creating content in 2017. Why are marketers creating content? 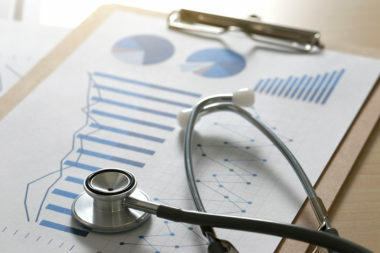 B2C healthcare brands say the primary goals are a mix of boosting brand awareness, engagement, and patient/customer loyalty. 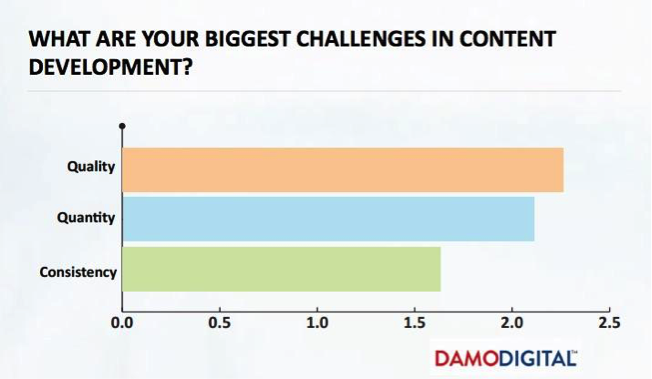 B2B healthcare brands, on the other hand, say that their top goal by far with content creation is lead generation. As for which social media channels are working for content distribution in 2017, that varies a bit by company type. For healthcare marketers, social media has evolved into an important paid channel, with 75% of firms saying they’re investing in social ads in 2017 to promote/distribute content. 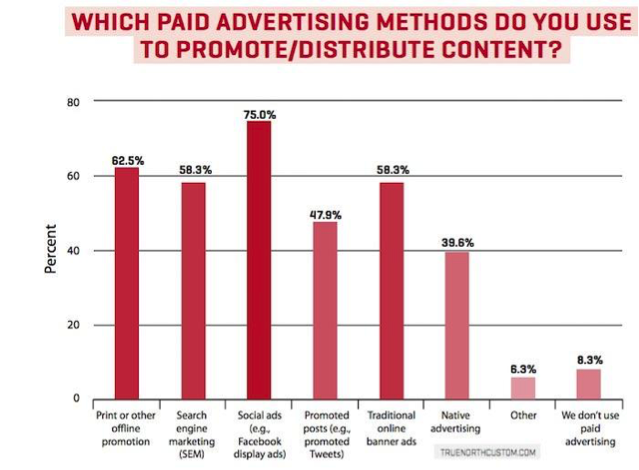 This is ahead of the share that are spending marketing budget on print/offline promotion (63%), digital banner ads (58%), and search ads (58%) to promote/distribute content. 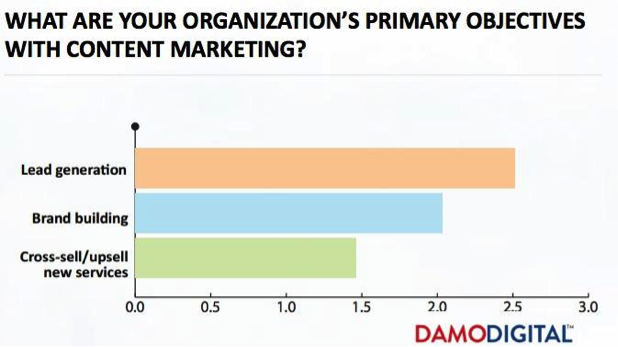 In general, healthcare marketers seem to be fairly pleased with their content efforts to date: 67% say their organization is somewhat effective with content marketing and 28% say their organization is very effective with content marketing. However, these healthcare brands are still facing some struggles with their content marketing efforts. B2C healthcare brands say some of the top issues with their current content creation and strategy efforts are: measuring effectiveness, producing engaging pieces, producing a variety of pieces, budget constraints, gaps in team skills/knowledge, difficulty finding staff, and a lack of integration across departments. 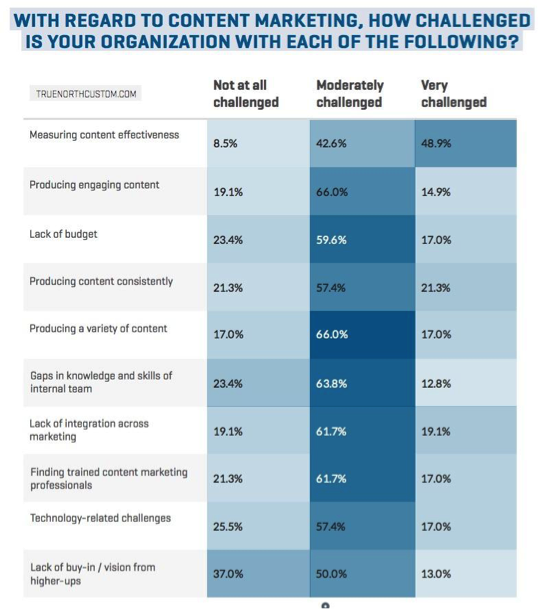 B2B healthcare marketers say the top challenges they face with their current content marketing efforts are maintaining quality, producing enough pieces, and publishing consistently. Despite these challenges, the future looks bright for healthcare content marketing. Some 60% of B2B healthcare firms plan to increase their content budget in 2017 and 48% of B2C healthcare firms expect to increase their content budget this year. What will all that additional spend go toward? B2B healthcare marketers say their top priority is to invest in more thought-leadership pieces, specifically white papers/articles. 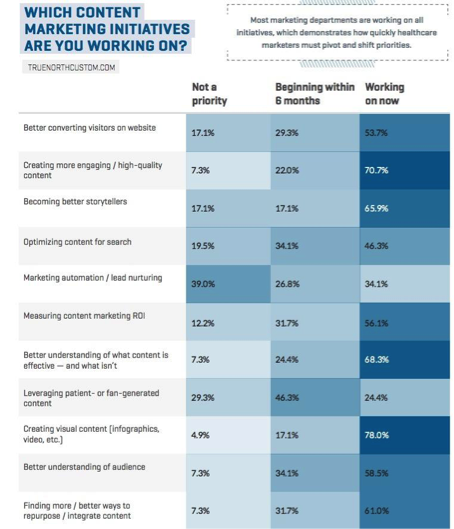 B2C healthcare marketers say some of the top initiatives they’re working on are creating more visual content, creating more high-quality content, working to better measure content effectiveness, and becoming better storytellers. Ultimately, the state of content marketing in 2017 appears to be strong and should grow even stronger in the years ahead. Businesses already are pleased with their efforts and are investing in the areas (content quantity, quality, and measurement) that are currently pain points. That bodes well for this year and well beyond. Treat yourself to the latest news in healthcare content marketing. Contact MDG Advertising today at 561-338-7797 or visit mdgadvertising.com.